A well-known native and widespread British tree. Although it has Ash in its name, it is not actually part of the Ash family, even though the leaves look similar. 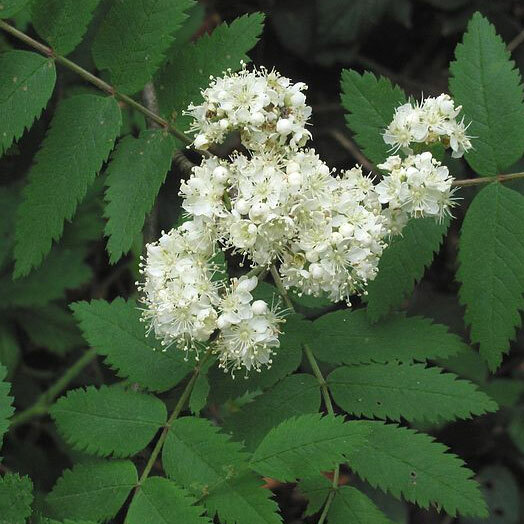 It appears that the Mountain Ash or Rowan tree is partial to a bit of identity theft as it is also known as The European Mountain Ash, Quickbeam, Ranty, Rowanberry, Rantry or Roan. If you have trouble with the name of your tree, we suggest calling it Bob. This is spreading tree with rich green leaves that turn almost florescent red and yellow in autumn, especially after cool summers, such as that of 2007. Clusters of small white flowers mask the tree in late spring. Similarly, clusters of wonderful crimson berries are a real attraction in autumn and the foliage provides some great colours too. The berries are soon eaten by birds, especially Redwings, Fieldfares, Blackbirds, Mistle Thrushes and Waxwings, making it ideal for a wild or woodland garden and planting a number of trees as a copse will create a birds paradise! Mountain Ash or Rowan is a conical-shaped tree and copes with harsh conditions, sometimes seen on the sides of mountains but it is also ideal for a small, urban gardens. The bark is a smooth, silvery/grey on young trees which changes to a scaly light grey-brown. Sometimes older trees will have fissured bark. If you live in a particularly cold part of the UK then the Mountain is is suitable for planting in your garden. If it can live 1000m up a UK mountain, it should do well in your garden. If planting in an estate, the big open country type not council, then be aware that Red and Roe plus Mountain Hares feed on the bark. The Mountain Ash or Rowan tree are considered to be magical guardians against black witches, enchantment and other sinister forces and commonly have been a feature of churchyards to keep watch over the spirits of the deceased. Believe that if you will and we think each house should have one! The Mountain Ash (Sorbus aucuparia) is suitable for occasional thinning to promote new growth. So if you have a couple of long thick branches with little growth on it, you can cut it back and expect new growth to replace it which should thicken it out some. Most coastal locations will support a Mountain Ash however Tsunami's and over enthusiastic RNLI boats landing on the beach would cause you some problems and would not be covered by our tree warranty! Exposed sites are also ok for the Mountain Ash however you may experience slightly reduced growth based on local conditions. Wet sites are also tolerated by the Mountain Ash however if you need a snorkel to dig the hole to put it in, we suggest that your garden is not wet but flooded and you should not be planting anything in there except ducks. Mountain Ash will also perform well in clay although a bit of organic matter mixed into the clay will help it along. This tree will tolerate extreme acidity soils but performs poorly in shallow chalk soils. 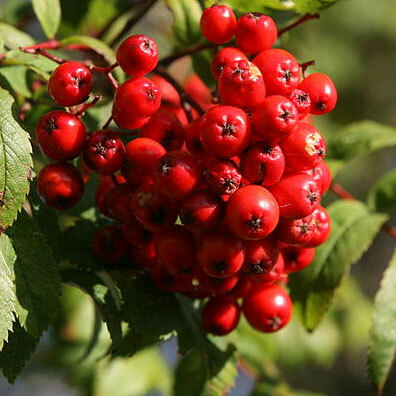 Expect the birds and wildlife to be attracted to your garden if you have the Mountain Ash planted as they provide fruits that can also be made in jams, drinks etc. The Rowan berries are high in vitamin C, quite bitter and come with a distinct flavour, often used to go with Game and Venison. The jury is still out on this one but there is evidence that the Rowan berries have cervical cancer fighting properties. Not enough to put the NHS out of business but definitely enough to be considerably more than a placebo. The hardiness and adaptability of the Mountain Ash make it a good choice for ornamental gardens, parks and roadside avenue planting. The foliage is not particularly light blocking so grass and other plants underneath will fair well. A medium height tree, so expect a height of around 6-8m after 10 years. Could grow further depending on local conditions. We know this is a bit of a cop out and of little help, heights are just a guideline as local weather, soil conditions etc will dictate just how well your tree will do. You can always prune the tree to your desired height. Just to give you an idea, a 28m Mountain Ash has been discovered but these are very rare (it might have been cheating and standing on tip toes when measured) As a general rule of thumb, the harsher the conditions it faces, the smaller it will be and vice versa. Mountain Ash is quite a columnar tree so expect its width to be around a third of its height. Pruning is not essential except to take out diseased, dead or crossing over branches. 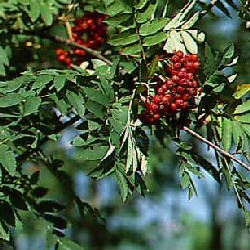 Our mountain ash (sorbus aucuparia) is supplied at a height of 1.5-2.0m in a 7- 12 litre container for year round planting.